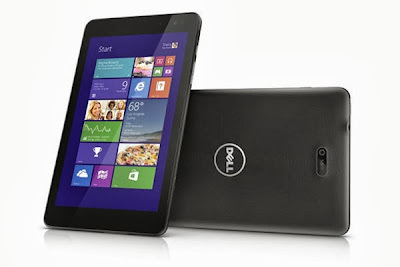 On Wednesday, Dell launched a slew of new devices, including tablets, laptops, and even a tablet/laptop hybrid. At a press event in New York City, the company showed off its Venue 7 and Venue 8 Android slates, Venue 8 Pro and Venue 11 Pro Windows 8.1 tablets, its newly refreshed XPS 15 and XPS 13 laptops, and its foldable ultrabook called the XPS 11. The Venue 7 and Venue 8 tablets came as a bit of a surprise reveal, as Dell dipped back into the Android market it appeared to have left behind. Neither slate is particularly mighty, though: Both run Android 4.2.2 (upgradeable to KitKat) and are powered by Intel Atom processors. The 7 features a 1.6 GHz dual-core CPU while the 8 is driven by a 2.0 GHz dual-core processor. Ostensibly, Dell is aiming to satisfy the budget-conscious Android fan with this offering, judging from the way the rest of its (middling) specs read. Both the Venue 7 and Venue 8 feature 1280 x 800 pixel IPS displays, USB 3.0, a battery life of 8 hours, and rather lackluster cameras (a 3-MP rear camera and VGA front-facing camera for the Venue 7, and a 5-MP rear camera and 2-MP front-facing camera for the Venue 8). The Venue 7 comes with 16GB of internal memory, and you can choose between 16 or 32 GB versions for the Venue 8. If that's not enough, the devices are expandable via a microSD slot. The 7 and 8 will be available on October 18, at $150 and $180 respectively. Dell also dropped a couple of Windows 8 tablets at the event: the Venue 8 Pro and the Venue 11 Pro. With the launch of these two slates, the company officially moves away from Windows RT. The Venue 8 Pro, a pocketable 8-inch device with a 1280 x 800 IPS display and pen input, is one of the only competitors in the space of sub-10-inch Windows tablets. The slate includes Intel's new quad-core Bay Trail CPU, 2GB of RAM, 32GB of internal storage, and 10 hours of battery life. It's scheduled to go on sale on October 18 in the U.S., priced at $300. The Venue 11 Pro, conversely, is a real rival for the Microsoft Surface Pro 2. It features a 1920 x 1080 HD IPS display, and can be powered either by Intel's quad-core Bay Trail processor or a fourth-generation Haswell CPU that goes up to Core i5. With its specs maxed out, the Venue 11 Pro can support 8GB of RAM and 256GB of storage, and it includes WiDi, NFC, a full-size USB port, HDMI port, and a microSD slot. Also worthy of note, the Venue 11 Pro's battery is removable—so in an emergency, users can swap it out with a fully charged one (if they're away from their charger). In the realm of laptops, Dell refreshed its reliable XPS 13 and XPS 15 models, endowing both of them with Intel's Haswell processors. The XPS 15 got the drastic upgrade, as it now flaunts a truly impressive quad HD+ IGZO display; it's 3200 x 1800 pixels, higher even than the Retina MacBook Pro (2880 x 1800). It also boasts Nvidia graphics, 1TB of hard drive space in addition to a 32GB solid state drive (you can also opt for a single 512GB SSD), NFC, and voice features. Meanwhile, the Dell XPS 13 has gotten upgraded to sport a 1080p touchscreen, and improved graphics and battery life. The XPS 15 comes out on October 15 and goes for a $1500 starting price tag, while the XPS 13 will arrive in November, starting at $1000. Finally, Dell revealed more details about its XPS 11 foldable Ultrabook: It'll feature a Haswell processor, solid state storage, and a Gorilla Glass touch display flaunting a dense 2560 x 1440 pixel resolution. There's a keyboard too, of course, which folds around the XPS 11's back at 180 degrees. The XPS 11 costs $1000 and will be available this November. Chemistry of all Lanthanides is so identical? Explain why the boiling point of propanic acid is much more higher than that of n-butyl alcohol although both of them have same molecular weight. How are kidney stones prevented? How much vitamin D does the mother need ? How to prevent rosting of tap ? What is Buckminister fullerene ? How to work web address ? Why Alums Are added in Town Water Supply? What are π-acceptor and π-donor ligands?